Who says you can’t create a stylish bathroom on a budget? While the bathroom used to be an afterthought, it is now one of the most important rooms in the home – and can often add a lot of value onto your property if you’re thinking of reselling. And it’s no longer enough to have a basic suite; resources like Pinterest and Instagram have us dreaming of amazing monsoon walk-in shower cubicles, free-standing bathtubs and decorative tiles creating a bathroom that is equally fashionable as it is functional. And let’s face it, they don’t always come cheap. However, it is possible to create your dream bathroom without splashing out too much. With some savvy planning and budgeting, you’ll save money and have a bathroom that you’ll be proud to show off. It’s too easy to get carried away when you start shopping for bathrooms, and costs can quickly mount up. As well as considering the price of your toilet, basin and bath, remember to factor in additional costs such as hiring a plumber and other practical elements, like ensuring the room is properly ventilated and well-lit, then create a final budget that you have to stick to. Sure, that free-standing tub in the middle of Myleene Klass’ bathroom looks incredible, and Eva Longoria’s suite looks more like something from a luxury spa. But will that huge walk-in shower cubicle or oversized tub work in the room you have, or is there a better way to use the space? It’s important to be realistic about what you can achieve, and what the finished result will be. Use an online design tool to see how your room could look to avoid any big – and costly – mistakes. While it may be easier and quicker to enlist a specialist bathroom company to completely design your room, you’ll save a lot of money by designing the space yourself and buying your own fittings. Then you simply need to hire a builder or plumber to install the suite to fit your plan. Ask around family and friends for recommendations of reputable tradesmen who may be able to help. If you’ve decided to go down the DIY route and design the bathroom yourself, don’t just go for the first thing you see. Shop around and you may find some bargains. There are a number of online bathroom stores that may offer better prices than you’ll find on the high street, with sites like Soak.com having regular sales and offers, as well as allowing you to order free tile samples so you can be sure of your purchase before you order. 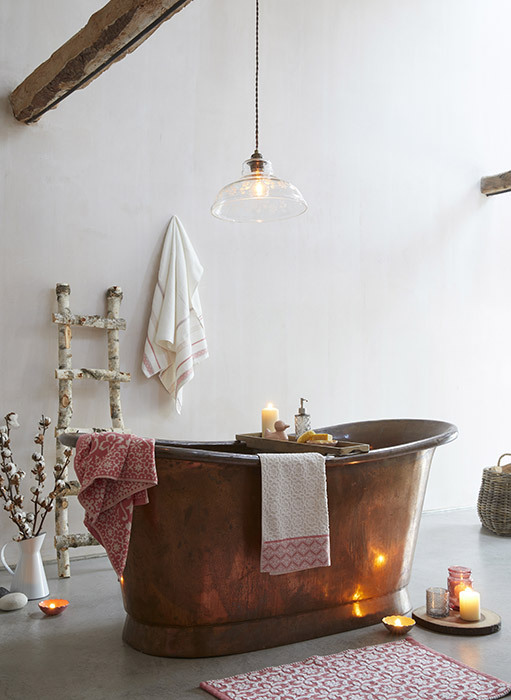 If you have to have that copper tub or ornate vanity unit then go for it! 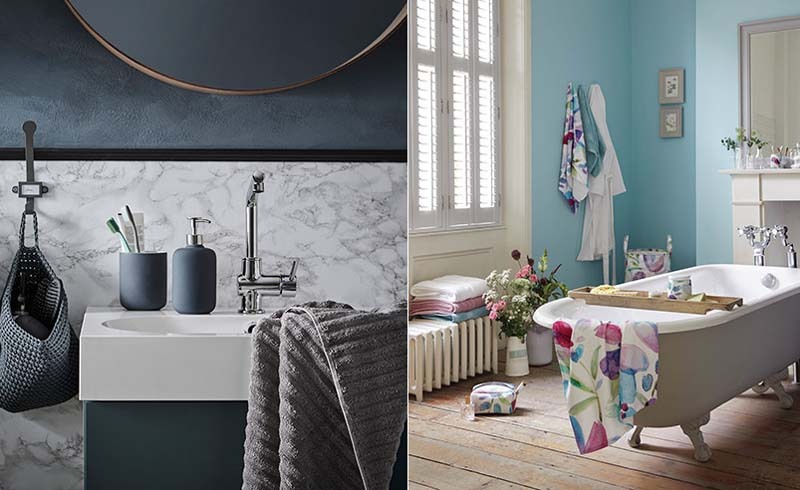 One investment piece can transform your whole bathroom, and will work equally well when pared back with some more budget-friendly pieces. You don’t have to spend a fortune to create a luxurious bathroom. 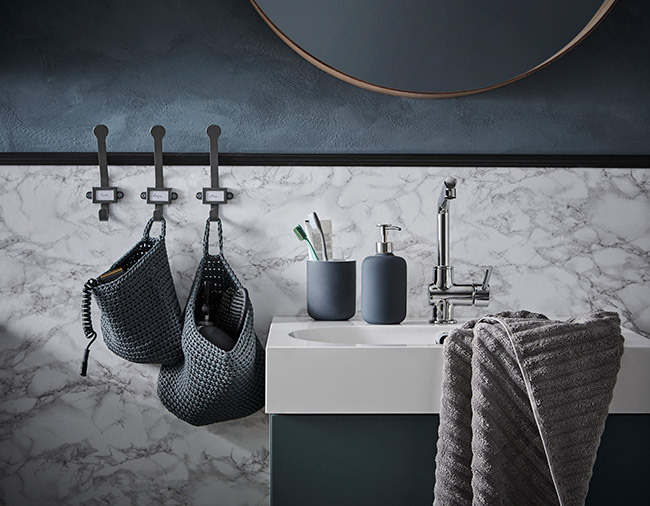 Stores like H&M Home, Dunelm, Wayfair and IKEA all have designer-inspired pieces for the bathroom, from storage units to mirrors and accessories that will add the perfect finishing touches to the room for less. It’s now possible to get realistic and high-quality interpretations of natural stone, marble or wood finishes on ceramic tiles, so you can still get the look you want but for possibly hundreds of pounds cheaper. You’ll find maintenance easier, too, as the effect tiles don’t need to be sealed to protect them from water damage. 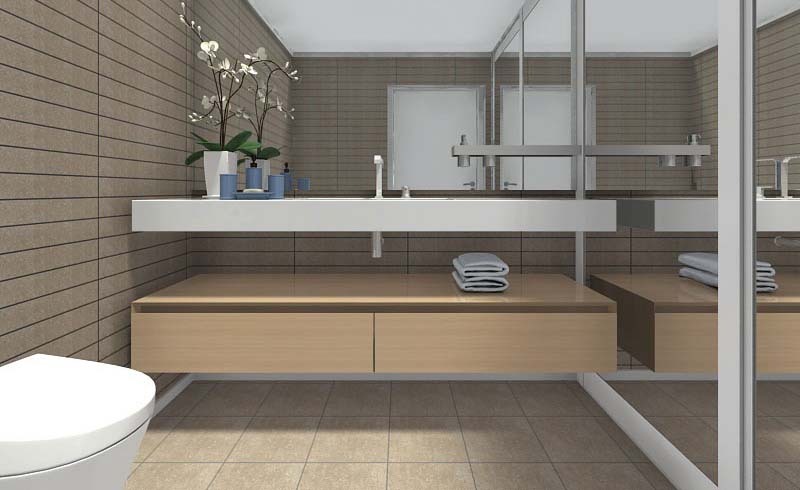 Try not to be too swayed by fashion trends when it comes to picking your bathroom suite. These could easily date and leave you out of pocket if you change your mind and want to replace it within a couple of years. A classic white suite won’t date and can be upgraded with fixtures and fittings such as premium taps, flooring and accessories, and will work regardless of if you change the colour scheme. If you’re going for a full bathroom refurb, don’t reposition anything that doesn’t need to be moved, as this can prove to be very costly. Moving the toilet, for example, would require moving both the toilet drain/vent and waste water systems, as well as supplying water to its new spot. It may well be more hassle, and expense, than it’s worth! It’s not just the cost of fitting your bathroom that you should consider, but also your water usage. Fitting a flow restrictor to your shower will help to limit the amount of water you use without affecting its performance, while you can also try the Hippo, a water-saving gadget that is popped into the toilet cistern and will reduce the amount of water used in a flush by up to three litres.